Whether you live in the country or the city, for many among the general public, ignorance of honeybees is complete. Having been stung by hornets and yellow jackets, they assume having any kind of bee nearby spells trouble. Not true. It’s up to you to take steps to educate them and alleviate their fears. Restrict your bee yard to one or two hives, particularly if you’re in an urban setting. Having only a couple of hives is far less intimidating to the uneducated than having a whole phalanx of hives. Locate your hive in such a way that it doesn’t point at your neighbor’s driveway, your house entrance, or any other pedestrian traffic-way. Bees fly up, up, and away as they leave the hive. When they get 15 feet from the hive, they’re way above head level. Don’t flaunt your hives. Put them in an inconspicuous area. Paint or stain your hives to blend into the environment. Painting them flame orange is only tempting fate. Provide a nearby source of water for your bees. That keeps them from collecting water from your neighbor’s pool or birdbath (see the earlier section “A nearby source of water” for more info). Invite folks to stop by and watch you inspect your hive. They’ll see firsthand how gentle bees are, and your own enthusiasm will be contagious. Let your neighbors know that bees fly in about a 3-mile radius of home plate (that’s roughly 6,000 acres). So they’ll mostly visit a huge area that isn’t anywhere near your neighbor’s property. Give gifts of honey to all your immediate neighbors and/or your landlord. This gesture goes a long way in the public relations department. 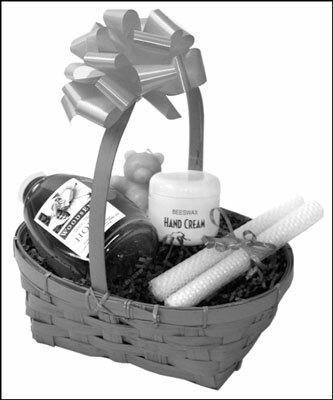 This gift basket of honeybee products could go to each of your immediate neighbors. That’s sure to help keep the peace.